Based on the proven time-management concept of “Time Blocking” your Daily Taskinator (aka The Taskinator) is your one-sheet solution to get important tasks done in each of the important areas of your life. If you have ever woken up one morning with so much stuff to do but no idea where to start, the taskinator is the right tool for you! If you’ve seen yourself waste so much time during a day because you didn’t plan for it properly, the taskinator is the right tool for you. There are various ways to use the Taskinator. Have a go at it, download it, and let us know what you think of it in the comments section below. We’ll be posting various articles on how best to use the Taskinator over coming days. If you’re used to planning your weeks in advance (or would like to start planning your weeks in advance), the weekly taskinator is a nifty one-sheet hack designed for this purpose. What’s unique about the weekly taskinator is that it doesn’t force you to think of the nitty gritty tasks per day, but simply allows you to determine the ‘Project of the Day’ for each day of the week and the 3 most important tasks associated with them. You can then easily feed that information into your daily taskinator. Again, we’ll be posting various articles on how best to use the weekly taskinator over coming days. Borrowed from our famous ProductiveRamadan.com habitator – the ProductiveMuslim Habitator is what’s commonly known in the Productivity sphere as the Habit List. The idea of the Habitator is to help you develop (or destroy) good (or bad) Habits by keeping track of them each and every day. Kick a bad habit or start a good one by downloading the habitator. Let us know when it works with you! 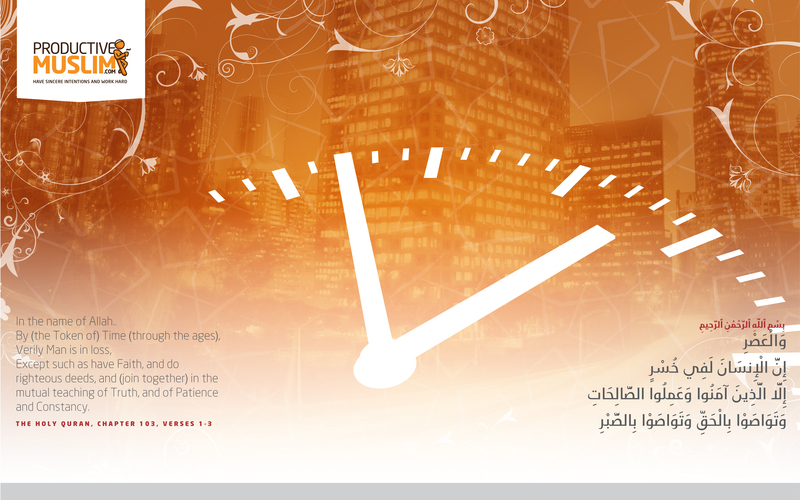 Inspired by the verses of Surat Al-Asr and beautifully designed by well-known Graphic designer Br.Peter Gould from CreativeCubed, this wallpaper design would serve as a daily inspiration to make most of your time in this world and hereafter. Best of all, it’s for FREE! Download it and share it with your family and friends!